Although modest and simple, the typical Amish house reflects the importance of the family, daily work, and humility. Amish homes are usually large with two stories since many Amish families consist of six or seven children. The homes tend to be plain and are usually painted white, green, blue or brown which are the colors of nature. Everything within the house is functional. To preserve the religious value prohibiting pride and vanity, pictures and photographs are not hung on the walls for decoration. Amish furniture is well-made and sturdy but modest in design. Curtains, shades, and quilts may feature colorful designs but are also modest and simple. When designs are used, typical motifs tend to involve depictions of nature such as doves, roses and trees. A popular misconception is that the outside of Amish barns and houses feature geometric designs known as hex signs. Although hex signs can be commonly found throughout Lancaster County, they are not used by the Amish. As part of the Ordnung and the tenets of the Amish religion, electricity is not used within Amish houses. Instead, alternate means of energy are used. For instance, in Amish kitchens refrigerators and stoves are often powered by various types of natural, propane or bottled gas or kerosene. Special allowances are made in the Amish built home to accommodate the prohibition against electricity. For instance, homes often feature skylights to increase the lighting and inverters are sometimes used to pull currents from a battery source so that appliances such as electrics fan can be used. However, you won't find a telephone, television, stereo, or computer in an Amish teenager's bedroom or anywhere else in the house. Such items are strictly forbidden. 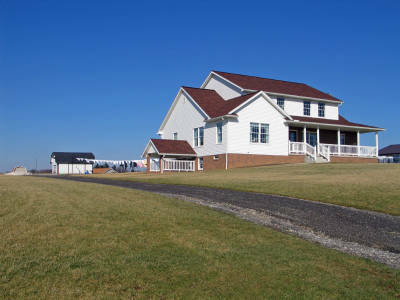 The Amish home is also designed to foster deeply ingrained views towards the sanctity of work as well as the family. An important part of the Amish working life centers around farming and the preservation of fruit, vegetables, and meat throughout the year. Since Amish families grow more produce than they need so they can supplement their income by selling to outsiders, a major part of Amish life is spent preserving fruits, carrots, pickles, beans, tomatoes, peas, and other vegetables. In fact, a typical family will preserve two thousand quarts of fruits, vegetables, and meat each year. For this reason, the kitchen plays a prominent role in the household. An Amish kitchen is built large and designed to accommodate many people in the tasks involved in preservation and bottling. The kitchen is so important that many families have summer kitchens used solely for these practices. As a consequence, the Amish kitchen has become a symbol of the closeness of the Amish family as well as of the work ethic of the people and their dedication to nature and food. Amish houses in Lancaster County tend to have large porches. Because Amish households consist of about six or seven children, a mother and father, as well as grandparents, space indoors can become cramped at times. Furthermore, children don't have the escapist release of the television, stereo, telephone, or home computer. As a result many families use the porch as a means of leisure and recreation. In fact, it is the ideal spot to enjoy a warm summer evening on a bench, swing or rocking chair. Families can pass the time chatting with relatives and neighbors while communing with nature and God. 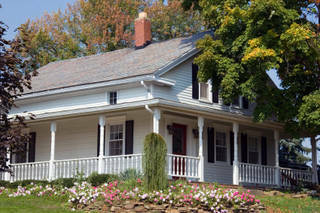 Amish farmhouses tend to have double or triple dwellings to house the grandparents. Traditionally among the Amish community, adults retire from active farming when they reach their fifties. When they do this, they move into an extra house that has been built on the land. A married son or daughter then takes over the main house along with the primary responsibilities for the farm.